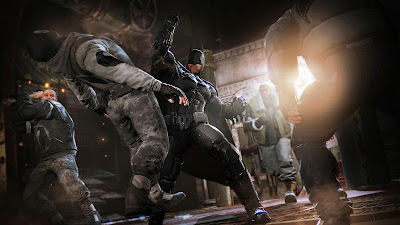 Long before the events of Arkham Asylum, Bruce Wayne has been donning the infamous cowl and cape for a couple of years, and is starting to become something of a myth in Gotham City. Is he man or monster, nobody seems to know. The good guys want him/it/whatever it may be behind bars, and the villains want him dead. Roman Sionis, AKA Black Mask, definitely believes that Batman is just that, a man. He has put a bounty on the head of the Bat, and invites the world's deadliest assassins to take him down. Batman, hunted by the cops, a gang of murderers and once again the Joker, must find a way to take down all of the assassins involved, and convince Gordon and the GCPD that he's on their side. It's a pretty forgettable storyline, and it's easy to just play the game and completely ignore the story. The thing is, it's just not as involving as the previous two games. The return of the Joker isn't exciting anymore, we've already seen and defeated him twice. Yes, it is a prequel, so he has every right to be here, but he shouldn't be. 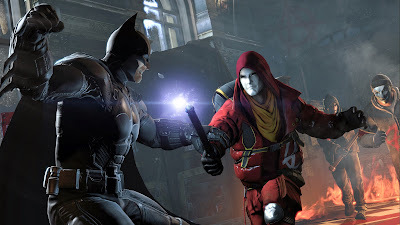 You are introduced to so many new characters, each trying to kill you before one of the others, that there isn't really an excuse for using the Joker again. It's not that the Joker isn't an interesting character in this one, as he definitely is. He's just as vile as before, and Mark Hamill's replacement has done an excellent job of replicating his instantly recognisable Joker voice. But three times in a row? The Batman series is overflowing with enemies, and it would have been a great opportunity to introduce a new menace. Most aspects of the game are the same as they were in the previous two titles in the series. The free-flow combat and invisible predator moments play out exactly the same as they used to, without any noticeable improvements or tweaks. To be fair, they couldn't really have done much without completely changing some of the core mechanics of the game. The gadgets are also not as inventive as they have been previously, with more tweaks to existing gadgets than new ones. Functions have been reassigned to gadgets with new names, which seems unnecessary, and the gadgets that are new are uninspired and forgettable. Instead of the freeze grenade, there's a glue grenade. It literally has the exact same purpose (block steam vents, create rafts, stick enemies) but to try and make it seem like they had some new ideas, they've re-skinned it. It seems a little lazy, which is not what anyone would have said about either Arkham Asylum or City. The crime-scene investigations are the stand-out feature of Origins. It starts with scanning the corpse to find out who it is, and the cause of death. With this information, you can figure out some extra details. Was the person shot, did they fall, was it blunt trauma? More scanning of details around the crime-scene allows you to simulate the moment and cause of death, and project it into the world. You can fast-forward and reverse through the events leading up to the death, pause at any time and walk around the 3D scene. This helps you with all kinds of things. Say the victim was holding a camera at the time of death, but you can't see it right now, all you need to do is rewind the scene until it's once more in the victim's hands, then follow the trajectory. There are some really awesome crime-scenes to look at, one including a crashing helicopter. Being able to go forwards and backwards through a really cool set-piece never gets old. The city itself is twice the size of Arkham City, but it doesn't feel lived in. Arkham City was basically a huge prison, so of course there are no civilians, but Origins doesn't have this excuse. A storm is keeping people off the streets, but that's hardly a good enough reason. It's doubtful that a little snowstorm would keep every single person off of the streets for an entire night. To really make Origins stand out, Warner Bros. should have just given us a living city with normal people to interact with. The sidewalk should be full with last minute Christmas shoppers, the streets filled with the cars of people making their way home from work, or driving to see their families. Another empty city is hard to get excited about. The city is also not very memorable. When playing other open-world games, you start to recognise landmarks and buildings and can learn the layout of the city. Unfortunately this is not true of Arkham Origins. The buildings all look very similar, and the snow covering them and falling in your face does not help in any way. There's also this bridge, right in the centre, connecting the two sections of the city. You'll cross this bridge so many times that you'll start to get annoyed at the sight of it. 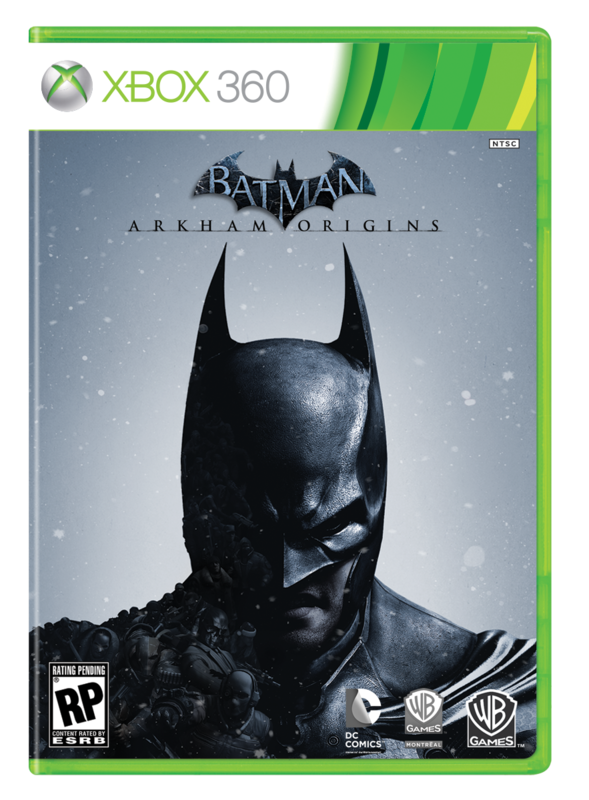 Arkham Origins does not live up to the high standards set by the previous two titles in the series. There are basically no new features, except from the very impressive crime-scene reconstructions, the city is bland and unremarkable and the story is barely there. There is a multiplayer mode, but after hours of searching, not a single game could be found, so if you were going to buy it for that, don't bother. The free-flow combat and everything you loved from the previous titles is back, so there's definitely fun to be had with Origins, but it's not a step forward. If you fancy another Batman game, this will fill the gap, but it definitely won't blow you away.